Skylanders Spyro's Adventure debuted in 2011 as the #1 best-selling kids franchise worldwide. If you haven't seen them, Skylanders are specially designed physical action figures that transport the character into the Skylanders video game when you place it on the “Portal of Power.” Each character has its own special set of skills and magical powers. It's a fun blend of physical toy and digital game play – and we’ve known several kids to enjoy playing with the figures alone. Skylanders Giants - Coming this fall, eight new "supersized" Skylanders will be available. Bigger than their Skylanders counterparts, they move in the game like giants – you’ll be able to do things and access new places in the game with the Giants’ special set of skills. For instance, when you put a Skylanders Giant in the game, there’s no need to jump from Skyland Island to another island. The Giants can pull the chains connecting the islands together showing their “Feat of Strength.” Despite their larger real-world size, you'll still be able to fit two Giants on the Portal of Power. 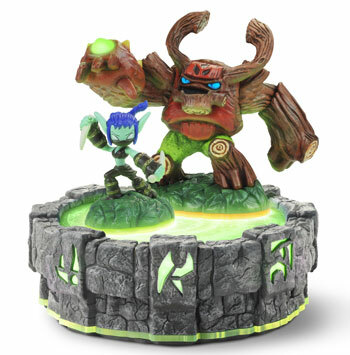 Unfortunately, Skylanders Giants will not be backward compatible and will require an updated version of the game when they launch in fall 2012. LightForce - One cool new feature for the new Giants action figures is how they glow when they get close to and are placed on the Portal of Power. Described as lighting up their "elemental core,” it’s a fun enhancement that doesn’t require any batteries. Score! New Exclusive Skylanders Action Figures – Eight characters with enhanced powers will be releasing this year. 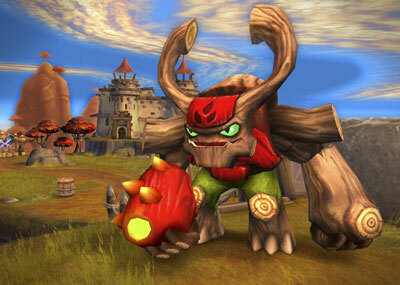 Twelve regular-sized skylanders key to evolving the game will be also be introduced. A new Trigger Happy will launch exclusively at Toys“R”Us in March with amped up powers. Expect the release of an iridescent Blue Bash character, a color voted on by the fans, in April. The Empire of Ice Adventure Pack is available now with new characters, including Slam Bam, with access to new levels and skills.